You are currently browsing the tag archive for the ‘Arnold Schoenberg’ tag. 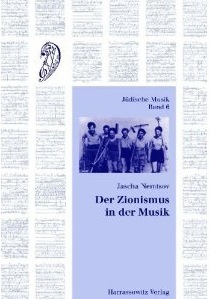 “Zionism was known as one of the few realized utopias in the twentieth century, probably the only one that in addition to addressing social concerns also had a distinct humanistic character,” writes Jascha Nemtsov in the epilogue to his monograph on the role of music in the Zionist movement in the first half of the twentieth century (349). 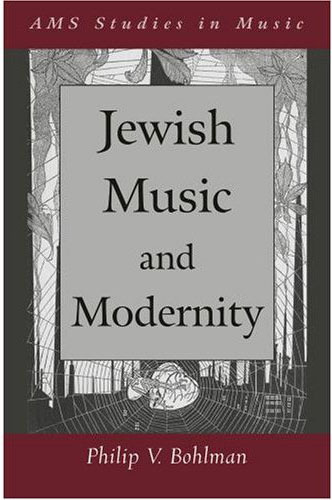 A somewhat nostalgic tone permeates this truly amazing volume, which relates many facets of Jewish musical life to Zionism, commonly defined as a late nineteenth-century political movement dedicated to establishing a Jewish homeland. Nemtsov, who is well aware of the negative connotations of nationalism in the twentieth century (he quotes Ernest Gellner’s view of nationalism as “diabolical and lethal”), pleads for exception for Zionism. Probably even more forcefully than other nationalist movements in the twentieth century, he claims, Zionism put an emphasis on culture and thus brought about a Jewish cultural renaissance around the globe. It is these cultural, and specifically musical, ramifications of Zionism that interest Nemtsov, who presents Zionism as the unifying force that enabled a heterogeneous Jewish Diaspora culture to have a common focus. Nemtsov’s nostalgia derives from his sense that Zionism’s idealistic goal fractured as Zionism developed from an energetic political and cultural movement in the Diaspora to ossified official policy in modern Israel. According to Nemtsov, there were also other factors that made Zionism anachronistic by the second half of the twentieth century: the almost total annihilation of European Jewry, which served as the cradle of Zionistic ideals; the repression of Jewish culture in the Soviet Union, which was the center of Jewish life before the Revolution; a new Israeli culture that consciously tried to eliminate characteristics associated with the Diaspora; and a postmodern sensibility in the arts that fits uneasily with the optimistic ideals of Zionism. What Nemtsov does not mention as a contributing factor to the demise of the Zionist idea is the conflict between radically different visions of Zionism in present-day Israel, manifested in a less nostalgic account of Israel’s Zionist past by “new historians” such as Tom Segev. 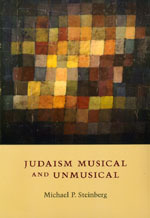 In Judaism Musical and Unmusical, Michael P. Steinberg takes the reader on a journey through predominantly but not exclusively Central European Jewish history and culture in the nineteenth and twentieth centuries, at times privileging music as a focal point of cultural discourse. The eight essays in this volume, most of which have been published before, are loosely connected musings about the different facets of modernity and Judentum, and involve the concepts of memory, secularity, and aesthetics, among others. In each chapter Steinberg weaves different threads together, from art to psychoanalysis, from architecture to music. Steinberg’s book, which in a larger sense is a discourse about identity and Judaism, begins with an essay on Edward Said and his propositions of Jewish identity, and follows with individual case studies of known intellectuals and their work. Steinberg traces the subject of Judaism in Sigmund Freud’s late classic Moses and Monotheism and in the writings of Henry James, Eduard Fuchs, and Walter Benjamin; and he explores the intellectualism of Italian Jewish historian Arnaldo Momigliano. Further chapters center on the artist Charlotte Salomon and her Life? or Theater? and Leonard Bernstein in Vienna. The journey ends in Berlin with a critique of its Jewish Museum and an assessment of some recent scholarship on German Jewish subjects, which cannot compensate for the absence of a full bibliography at the end of the book.